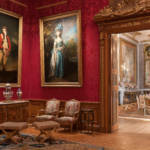 Waddesdon has one of the most important collections of paintings by Joshua Reynolds in the world. The paintings have been catalogued and researched over the years, but never subjected to technical analysis, so we have been working on a scientific investigation of all 14 works. Other museums, including the Wallace Collection and Tate Britain, have carried out similar analysis on their Reynolds’, some of which relate to portraits in the collections here, so the results are being shared in the wider curatorial and academic community. Joshua Reynolds’ painting of Mrs Abington as The Comic Muse, 1764-1768, de-framed and awaiting X-ray and infra-red scanning. 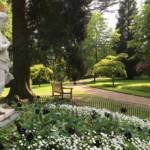 Waddesdon (National Trust) Bequest of James de Rothschild, 1957; acc. no. 2304. Photo © National Trust, Waddesdon Manor. As part of our project, each painting has been taken off the wall and de-framed (quite an operation since in some cases, the frames are built into the wall rather than simply hanging on picture rails). They are then X-rayed and images using infra-red reflectography are made. 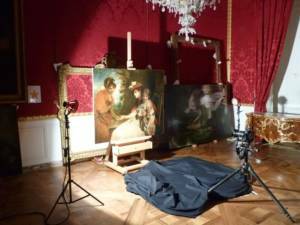 In previous years, this would have entailed transporting each painting to a specialist studio. 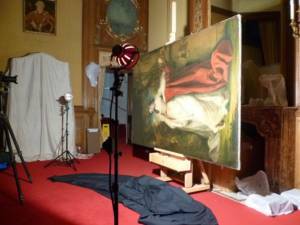 Now, the equipment comes to the paintings, and we turned two rooms in the Manor into temporary photographic studios so that John Twydle and colleagues from The True Image Solutions could work “in situ”. Once the images have been taken, it allows the conservator, Rica Jones, to see below the surface of each painting, before each is examined intensely closely and samples of paint and binding media taken and analysed. Joshua Reynolds, A Fortune Teller, 1777, de-framed and awaiting X-ray and infra-red scanning. Waddesdon (National Trust) Bequest of James de Rothschild, 1957. acc. no. 690. Photo © National Trust, Waddesdon Manor. Reynolds was famous for his technical experimentation – trying out all kinds of materials and techniques in the search for vibrant and lasting colour. Many of his experiments are still not understood so this scientific analysis will throw new light on them.